The Malaga Province Representative Team , colloquially known as Team Malaga, is the equivalent of a UK County side. Spain is split into Autonomous regions, which in turn are split into Provinces. 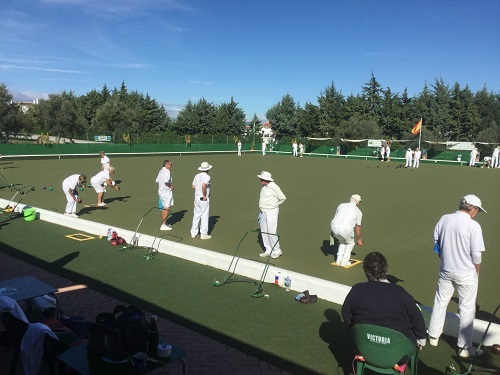 The region of Andalucía plays bowls in 3 of its Provinces - Almeria, Huelva and Malaga. Provincial sides can only play official Matches against other Provincial sides. This limits our Matches somewhat as currently only Almeria and one of the Valencian Provinces have Provincial Sides. Historically we have been very proud to play “friendly” Matches against the Spanish National side for many years, to give that side some much appreciated practice. Those matches have been tough and competitive for both sides, despite the “friendly” tag. Matches against Spain have been 10 a side (with each having a squad of 12) for both Men’s and ladies Matches but the recently inaugurated Inter-Provincial Matches were 13 a side with a squad of up to 15 bowlers, again for both Men’s and Ladies matches. Matches are held over a 2 day period, with games taking place over 4 sessions. Team Malaga hold regular selection and training sessions throughout the season. Reside in the Province for the season in which they are being considered for selection. Clarification: Our season is October - April. Candidates should be resident in Malaga province for most of that period. Vacations / travel are of course permitted but the main place of residency for the season should be within the province. The Team Malaga Manager is responsible for both the Men’s and Ladies teams, assisted by their Team Captains and Vice captains. The Team Malaga Manager is an annually elected position with the Team Captains and Vice Captains appointed by the Manager. The Team Manager may also appoint additional Selectors as he sees fit. Folowing the Trials Days the squad has been announced for the Team Malaga vs Spain friendly in January 2019. "Team selection is never an easy job and when deciding between players of this calibre, even more so." said Team Malaga Manager, Paul Hughes." I would like to thank everyone who participated and hope those who have not made the squad this time will continue to support the Team and try again for the next match against Almeria."